Kicking off the BASF Cotton Consultants Conference is Dr. Gary Fellows, BASF Technical Market Manager. Dr. Fellows started things off by announcing that Headline fungicide is now registered for cotton. He says that 4 years worth of field trials are showing great results. Many of the cotton consultants here were hearing the news for the first time. 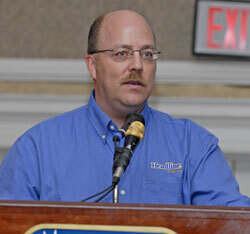 The conference provided an opportunity to learn how a fungicide can help at harvest time. Dr. Fellows says that it’s about protecting the “money bolls” so timing of application is important. He says that an application of Headline fits right into a cotton spray program.